While it’s not the sexiest plane out there, the Boeing 737 is the world’s most sold — with more than 9,200 Boeing 737s delivered — and flown aircraft. Its versatility allows carriers like RyanAir to pack 189 passengers for short hops in Europe or airlines like SAS to offer an all-business transatlantic flight with 44 seats from Texas to Norway. Still, Boeing isn’t resting on its past success. The company’s consistently working on the newest redesign of the popular 737 base model to come up with the newest, most competitive model. The latest of these redesigns is the new 737 MAX, which is designed to be up to 40% more quiet and 14% more fuel efficient than Boeing’s most recent 737 Next-Generation model. While the plane might look strikingly similar on the outside, Boeing must re-certify each redesign as if it’s launching a brand-new aircraft. This might seem unnecessary at first blush, but even a seemingly minor tweak might cause unforeseen instability for the aircraft. For this reason, the FAA requires each new model to go through a series of extreme tests to demonstrate its safety. 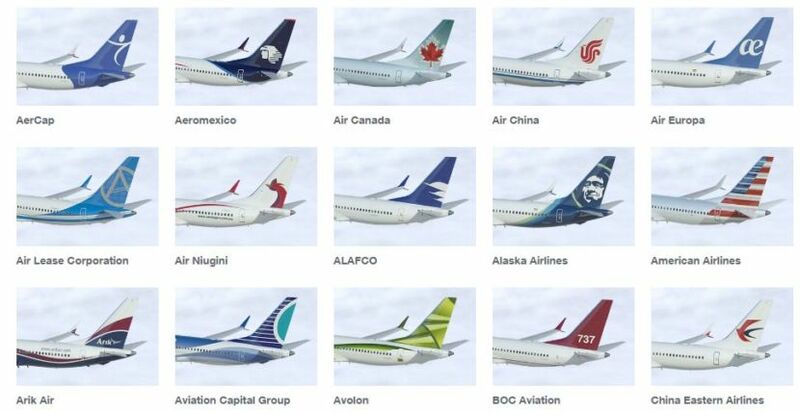 Just the first 15 of Boeing’s 737 MAX customers. Image courtesy of Boeing. And Boeing needs to get this one right; it’s already sold 3,331 Boeing 737 MAX aircraft to 69 different buyers. That’s almost 25% of all 737 aircraft orders in the plane’s nearly 50-year history — before the first MAX has been officially delivered! Only the 737-800 model has sold more (5,015). In just a matter of years, millions of passengers will be relying on this new aircraft to safely deliver them to their destination. Just a week after Wired brought us an awesome inside look on how Boeing builds a 737 in just nine days, the publication is offering a look inside the 737 MAX test plane. Check out the video below for the fascinating explanation of the types of tests that the new aircraft is put through. #AvGeeks: Prepare to control your squealing. As you can see, the inside of this 737 MAX looks quite different than the one we toured at Farnborough, which was mostly mocked up with the interior of 737 MAX launch customer Southwest. Are you looking forward to flying on the new 737 MAX?